Lead rubber bearing (LRB), similar with high damping rubber bearing, belongs to seismic isolation bearing. It is composed of multiple layers of elastomeric material and vulcanized reinforced steel plates with a central lead core. Generally, the rubber for making lead rubber bearing is nature rubber and the shore hardness of the rubber changes from 45 to 55, more flexible than the elastomeric bearing pad. 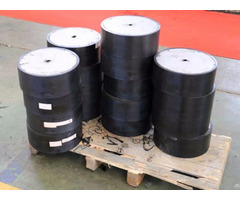 Lead, for making the lead rubber bearing, is a kind of metal material with large ductility, that is, when it is subjected to the vertical impact pressure, it will produce plastic shear deformation which is constrained by the steel plate and the nature rubber. And the result is that hysteresis curve of the bearing is changed and the bridge bearing has excellent damping effect. Thus when subjected to high energy compression, bridge bearing with central lead core can produce large deformations and consume most of the energy, to avoid damage. 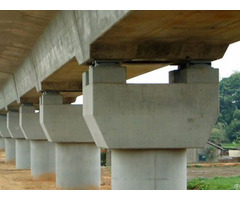 What's more, the lead rubber bearing used for bridge or construction is different. For bridge, it also needs the capacity of absorbing small vibration and rotation performance at support position. Thus, when using, you needs to integrate a variety of practical situations to choose the most favorable bearings. The damping coefficient of plain elastomeric bearing is less than 5%, while the lead rubber bearing is more than 15%. During the earthquake, the lead rubber bearing can increasingly reduce the accelerated speed and uniformly change the large force of the bridge superstructure, thus, lead rubber bearing has better seismic function. High purity lead. The lead core in the lead rubber bearing that we adopt is high purity and does not contain any impurities. Excellent seismic function. Lead core in the bridge bearing has high level damping of up to 30% by deforming plastically when the bearing moves laterally in an earthquake. Corrosion resistance. The steel plate are fully embedded in the rubber and sealed. Aging resistance. Rubber layer is coated on the surface of the bearing surface to protect the inner rubber. Strong recovery ability. When subjected to large displacement, lead rubber bearings with large ductility will have no residual deformation and can restore by itself. Practical function. Lead rubber bearing not only controls the displacement volume but also prevents the bridge from falling down. Easy maintenance. Available with additional anchor plates, the bearing can be easily removing for maintenance purpose. Business Description: Zaoqiang Dacheng Rubber Co., Ltd., founded in 1996, is a specialist for manufacturing and exporting bridge bearings. Now we are one of the biggest suppliers in China and our products have been exported to Mexico, Pakistan, the US, Korea and some other countries. To meet different needs of our customers, our company can supply various types of bridge bearings including elastomeric bearing, pot bearing, spherical bearing and seismic isolation bearing. Due to 20 years experience for making the bridge bearings, we can also accept the customized bridge bearings. With high quality nature rubber, neoprene rubber, stainless steel and advanced test machine for testing the bearing's performance under vertical loading and horizontal stretching, you can rest assured about quality of our bridge bearings. And we promise our every bridge bearing through standard and strict inspection. And we can provide various kinds of certifications and if you want to know about our certifications, please contact us.